Our former brothers from the deceased Warsaw Pact continue to feel neglected and unappreciated in Greater Europe. Until the 1990s, they suffered under the oppressive attention of the Soviet Union, which treacherously forced its peace policy on them, while issuing huge gratuitous tranches to create national infrastructure and industrial giants such as the Gdansk seaport, the Lenin Shipyard and the University of Warsaw. The Soviet Union also invited young Poles to study at the best Soviet universities, where their allowances were bigger than the salaries of even young Soviet scientists. The Soviet Union sent modern technology and fraternal friendship to this "Socialist superpower" in return for blackcurrant jelly, the Sopot song festival and films by Andrzej Wajda and Jerzy Kawalerowicz. I must say that both the jelly and the films were top quality. Yes, we helped them; we fed and dressed them, and in the meantime we also indoctrinated them. "I've had enough," shouted the son of a toad in the fairytale Thumbelina. "We've had enough," shouted the pseudo-western countries of Eastern Europe, which wanted real democracy instead of Soviet protection. Having Lech Walesa for a leader, a man who rose from an electrician at the Lenin Shipyard in Gdansk to president and Nobel Peace Prize winner, can really make people feel light in the head, turning their inferiority complex into superiority complex. The conditions for this change included western, including US, support for the human rights and Solidarity movements in the "oppressed" country. They also included the growth of anti-Soviet hysterics, and trivial discontent of the suburban but still proud psychology. It is this psychology that doesn't let Mr. Walesa, a Polish citizen and one-time president, rest on his Nobel Peace Prize laurels. It was probably his peace aspirations that urged him to demand that strong defenses be created in his newly free homeland against a treacherous and unpredictable neighbor. 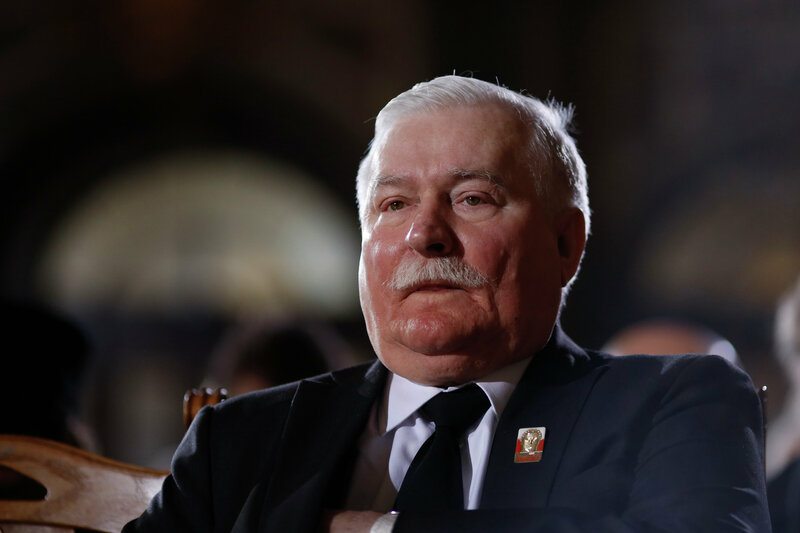 "Poland needs to stand up to Russia," Walesa said in an interview with the Rzeczpospolita daily. He went even further when talking to Italy's La Stampa: "We need missiles to aim at Russia. If Putin threatens us saying, "Beware, I have nuclear weapons," NATO must be ready to respond: "We have twice that many." [W]e want NATO to lend us the best missiles at its disposal, install them here and point them in the right direction. We won't start [a] war, we won't invade anyone. But, anyone thinking of setting foot on Polish soil will know that we are ready to ward them off," the 70-year-old wise man said, inviting NATO to deploy nuclear missiles in Poland. The Nobel Peace Prize winner's angry words for his great, but so far pseudo-western country, and the demand to give him nuclear missiles immediately, sound noble but frightening. Wales has killed several birds with one stone. First, he reminded the European community that Poland is an equal member of the union. Second, he showed that the new member country is burning with a desire to please the old and tired members and knows a trick or two. Third, he did this to intimidate Russia and to make it plead guilty for all crimes, including unemployment in Poland, and invite the valiant Poles to rule the country. This is not the first stunning thing the gray-haired Polish patriarch has done. In late September, he granted the Lech Walesa Award, which carried a $100,000 bonus, to Maidan activists. No one in the enlightened Western Europe stopped or chided him, actually encouraging him to continue to focus on Polish ambitions. Back in the "dark age" of the Warsaw Pact, Poland never thought to ask additional, A-weapon from the Soviet Union. Why? The country didn't do so because Poles knew that they were reliably protected by the Soviet Union, which liberated them from Nazi armies during WWII, and that Poland was a sovereign member of the Comecon (the Council for Mutual Economic Assistance), a Soviet-led economic organization of the Eastern Bloc and several other countries where Poland asked for and received the necessary assistance for its post-war revival and industrialization. Unlike the EU, the Comecon never forced production quotas for sugar beef, meat or milk production on its member states, and it did not punished them like it has recently happened to Latvia, Lithuanian and Estonia, which have been fined 3.2 million euros each for the excessive production, storage and marketing of sugar beet. One can understand the frustration and anger of the former president of Poland, who cannot blame its industrial and economic problems on Western Europe, the EU or NATO, and who must therefore find some other door to place his blame. Walesa said he needs the missiles to protect Poland from Russia. But what if he had some other target in mind? The tragedy in Ukraine has not only reshaped relations between Russia, the United States and Western Europe, but it has also ricocheted on pacifist values' world, turning Nobel Peace Prize winners Barack Obama and Lech Walesa, the doves, into aggressive hawks who are provoking a third world war. "I Olga Zinovieva, being a citizen of a free country and seeing the forced democratization of the world as in the case of Yugoslavia, Syria, Libya, Afghanistan, Venezuela and Ukraine, have no moral right to remain silent when the US President is increasingly using brazenly anti-Russian rhetoric, providing aggressive support to and pitching people against each other, and demanding that the process of a "peaceful" settlement be carried on in Ukraine. I wonder what the military way is, if a "peaceful" solution involves the use of prohibited explosive bullets, air raids against peaceful cities, and shelling ambulances that carry the wounded. "(…) Surrounded by ignorant aides who can't find Iran or Belarus on the map, the US President did not mention thousands of civilian casualties in Ukraine in his West Point speech, when he placed the full blame at Russia's door. Why didn't he raise his voice indignantly when peaceful people were burned alive in Odessa, just as Nazi did it during the past war? Whys is the planned extermination of people in Ukraine, which is described by all dictionaries as genocide, being carried out or supported by the private military companies whose mercenaries speak American English? Can't he understand the terrible language of extermination in a country whose forced indoctrination has cost the State Department $5 billion? "(…) Dignified members of the Nobel Committee, do you not fear a repetition of the horrors of the 20th century that have been denounced at the Nuremberg Trials as the worst crime against humanity and civilization? Where is your humanity? What happened to the noble ideals that underlie the Nobel Peace Prize? Will you continue to look on impatiently at the overseas "peacekeeper" terrorizing the world? "I demand that you strip US national Barack Obama of his Nobel Peace Prize and initiate criminal proceedings against him at the International Court of Justice in The Hague for committing military crimes against civilians and making statements and taking actions that led to the escalation of wars against the peaceful civilians of Syria, Libya, Afghanistan, Venezuela and Ukraine, and for trampling the notion of humanity and all other human rights norms and standards sealed in the UN Charter. Olga Zinovieva, widow of a WWII veteran and curator of the Russian thinker Alexander Zinoviev's intellectual heritage"
It is now clear to me that not only Obama but also Lech Walesa should be stripped of his Nobel Peace Prize. Otherwise the Nobel Committee will look like an authority for certifying state-sponsored instigators of war, extremism and terrorism, which would completely discredit Alfred Nobel's pacifist heritage.